Perfect for beginners fascinated with scuba diving, this 20-min scuba try dive in Goa will give you a quick and fast taste of the adventure sport. During a half-day session in Goa, you'll learn the basics skills of diving, test your technique while training in a swimming pool and complete one open water dive in the Arabian Sea. Accompanied by a certified dive instructor who'll guide you at every step of the dive, you'll plunge into the tropical sea for a 20-min dive near the dive spots of Grande Island. In the sea, you'll swim alongside schools of colourful fish, and explore the cool waters of the open sea. This trip is ideal for people who are short on time, yet want to experience the underwater beauty of scuba diving in Goa. NOTE: Even though travellers are not required to know swimming to book this trip, they must feel comfortable in the water. Your dive centre is located close to the Calangute beach, one of the more popular beaches of Goa. Here, you'll have a quick training session in the dive centre's swimming pool, before transferring to the dive spot near Grande Island. Located 1-hr boat ride away from mainland Goa, the waters of the Arabian Sea near Grande Island are a hotspot for scuba divers. Swim alongside schools of small, brightly-coloured fish, and explore the underwater beauty of the sea, with water tinted with shades of blue and green. 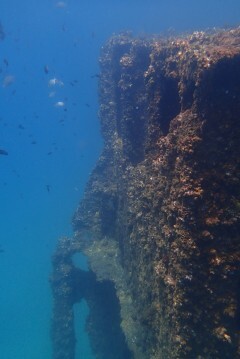 • Get introduced to scuba diving on this 20-min scuba try dive in Goa. • Learn how to dive during a quick, half-day session. • Complete a 20-min open water dive in the inviting waters near Goa. • Do a trial run to explore future certification courses in scuba diving. Travellers are required to sign a liability and indemnity form before the scuba try dive in Goa. Travellers are required to adhere to instructions of the dive instructor during this scuba try dive in Goa. For cancellations made more than 3 days before departure of the scuba try dive in Goa: 75% refund. For cancellations made 3-2 days before departure of the scuba try dive in Goa: 50% refund. For cancellations made less than 2 days before departure of the scuba try dive in Goa: No refund. Travellers will recieve an SSI certificate after successful completion of the dive. Travellers are requested to be punctual and report to the dive centre near Sunkissed Plaza by 07:00 hrs. Non-divers will be allowed on the boat transfer to the dive spot, only subject to availability of seats. The tour operator reserves the right to cancel or alter the itinerary of the scuba try dive in Goa to ensure maximum safety for travellers as well as staff. 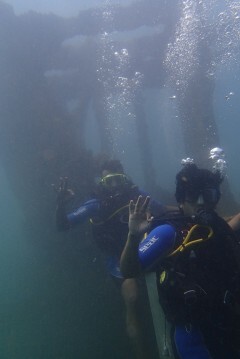 There is no pick-up for this scuba try dive in Goa. There is no drop-off for this scuba try dive in Goa. 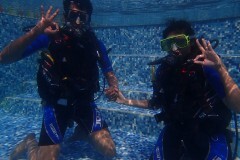 Scuba try dive in Goa! Report at the dive centre near the Sunkissed Plaza in Goa by 07:00 hrs. Once you arrive, you'll have a brief session introducing you to the scuba equipment and basic techniques of underwater communication and navigation. You'll also have a 30-min session in the swimming pool where you'll learn and demonstrate the skills required for diving. Ready for the open sea, you'll travel to the Sinquerim Jetty and embark on a 1-hr boat ride to Grande Island. At the island, go under the tropical waters for a 20-min scuba dive. You'll be accompanied by a certified instructor who'll guide you at all times. Return back to the boat after the dive, and transfer back to the dive centre. Your trip ends here.